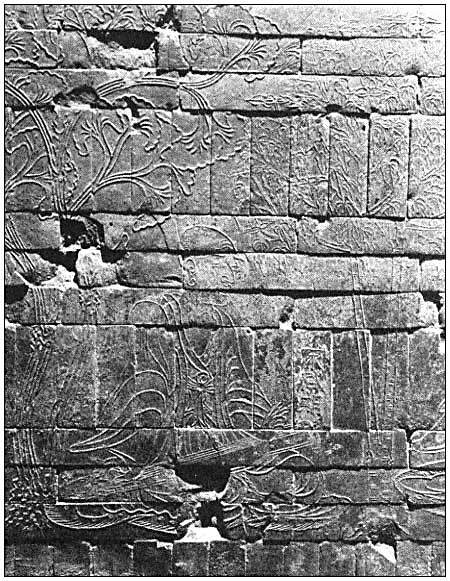 The Seven Worthies of the Bamboo Grove and Ginkgo trees, c. 4th century A.D. The Seven Worthies (Sages) of the Bamboo Grove, Rong Qiqi and Ginkgo trees. 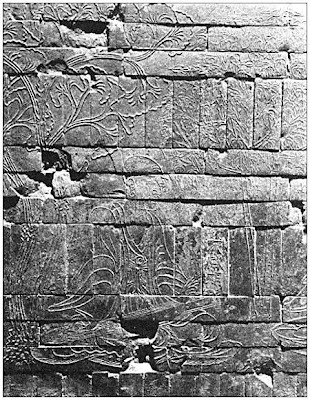 Rubbings made of the famous relief-murals on the bricks of a tomb found in China of the late 4th - early 5th century A.D.
More info and photos on a special page on my website. A Ginkgo biloba twig from 1799. "The twig inside this herbarium sheet is more than 210 years old. 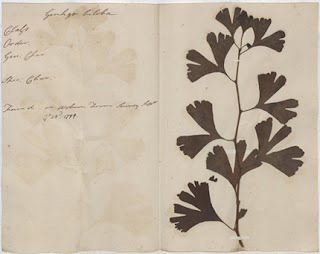 A herbarium is a collection of preserved plants which are usually pressed, dried and mounted on paper or card. We believe that a gentleman called Sir John St. Aubyn, 5th Baronet, collected this branch. The tree species would have been relatively new to St. Aubyn, as the tree had only been introduced to England from China a few decades before this specimen was collected. Maybe that is why he hasn’t made any notes on the left side, and left all of his subtitles blank." Chinese opera scene: dance with Ginkgo trees. 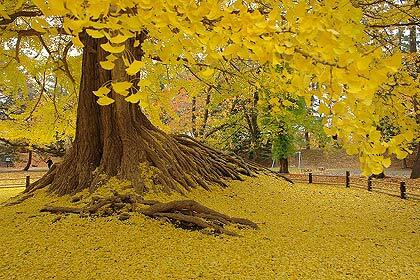 Huge old Ginkgo tree (c. 300 years) showing large part of its roots in Hirosaki Castle Park, Aomori prefecture. Hirosaki Castle Park is thought to date back to the early Edo period (c. 17th Century). Video of this tree on YouTube by siro3031. Photo: Aomori Digital Photo Archive. Ginkgo in fall color on the grounds of Capitol Hill. Location: northeast of U.S. Capitol. 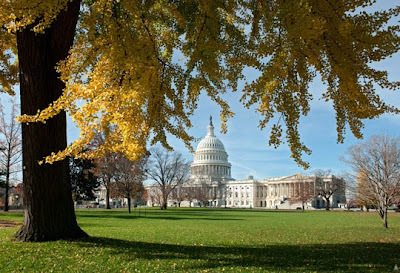 Photo (larger format) by Michael Dunn on blog of Architect of the Capitol. 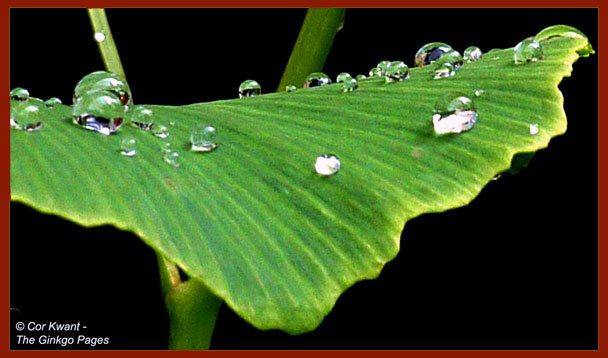 Ginkgo leaves are densely covered by wax crystals. This water-repellent surface is an effective way to avoid lasting contamination and colonization of possibly harmful micro-organisms. The photos in this video are taken at the forestry building, the Australian National University, during autumn 2012. Video by Sithu Tin Aung on YouTube.